Today’s Gospel we see Jesus asks the question: What will a person give in exchange for his or her life? Everything we have is an out-right gift from Heavenly Father. We owe him everything, including our very lives. It's possible to give God our money, but not ourselves, or to give him lip-service, but not our hearts. A true disciple willingly gives up all that he or she has in exchange for an unending life of joy and happiness with God. God gives without measure. The joy he offers no sadness or loss can diminish. The cross of Jesus leads to victory and freedom from sin, misery, and death. What is the cross which Jesus commands me to take up each day? When my will crosses with his will, then his will must be done. Are we ready to lose all for Jesus in order to gain all with Jesus? 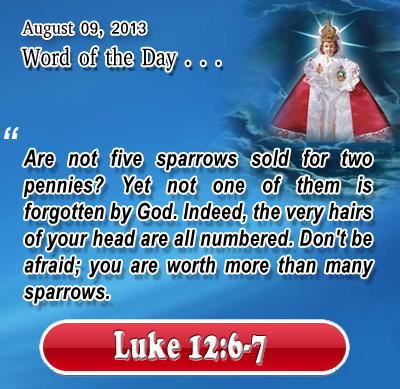 Luke 12:6-7 Are not five sparrows sold for two pennies? Yet not one of them is forgotten by God. Indeed, the very hairs of your head are all numbered. Don't be afraid; you are worth more than many sparrows. Heavenly God, Almighty Father, Tender Shepherd, you already know our heart. You know where we struggle with sin; please empower and forgive us. You know our fears; please encourage and strengthen us. You know our immaturity; please nurture and mature us. You know our weakness and disease please comfort and heal us. Holy God, we are both awed and comforted that you know us and love us. Thank you! In Infant Jesus' name we pray. Amen. 24Then Jesus told his disciples, "If any man would come after me, let him deny himself and take up his cross and follow me. 25 For whoever would save his life will lose it, and whoever loses his life for my sake will find it. 26 For what will it profit a man, if he gains the whole world and forfeits his life? Or what shall a man give in return for his life? 27 For the Son of man is to come with his angels in the glory of his Father, and then he will repay every man for what he has done. 28 Truly, I say to you, there are some standing here who will not taste death before they see the Son of man coming in his kingdom."